If you got to this page looking for "King of New York" featuring Christopher Walken, one of the coolest cats ever to grace Hollywood screens, then my apologies but don't leave so quickly. The Kings I am referring to are the winged celebrities that showed up in New York, in 2014. By winged, I mean birds - A Cassin's Kingbird (Tyrannus vociferans) found on November 15th by Kai Sheffield and refound by Clemmens Glasser and a Couch's Kingbird that might have been around as long as the Cassin's Kingbird but only reported by Gabriel Willow on December 25th, after obtaining photos of the bird from his friend Zack Winestine. Both these birds set the birding communities abuzz and many people from far and near made the twitch to get these birds on their life, state and county lists. If you think I am overstating the excitement caused by these two visitors, you only have to look at some of the media coverage that they got. 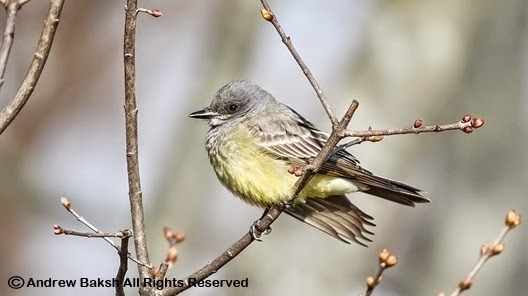 The Couch's Kingbird (Tyrannus couchii) due to the fact that it is a 1st state record and very likely where it was first observed (Jane and Washington Streets in Manhattan) got more coverage with many reports like the one by CBS. It was also reported that my favorite Game of Throne actor Peter Dinklage was also observed asking about and was shown the Couch's Kingbird. Now, that would have been a coup to have gotten his photo for my "Birders in the Field Album." Cassin's Kingbird at Floyd Bennett Field in Brooklyn NY. So what's the big deal about these two birds? Well, for starters they do not belong here. 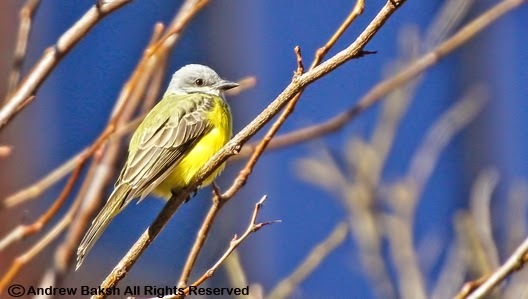 Cassin’s Kingbird, is a breeding flycatcher in northern and central Mexico and the western United States. This is a bird whose distribution is determined by its preferred elevation range. Although most of the breeding population in the United States is in south and central California, Arizona, New Mexico and west Texas, Cassin’s Kingbird also breeds regularly in southern Nevada, southern Utah, southeastern Colorado, southeastern Montana, eastern Wyoming, southwestern South Dakota, and extreme western Kansas and Oklahoma (Tweit and Tweit 2000). Couch's Kingbird is, a permanent resident throughout the central and southern portions of its range. 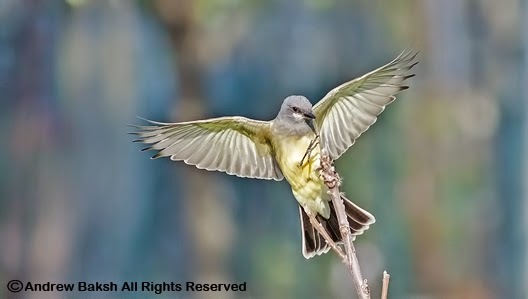 In Texas and northeast Mexico Couch’s Kingbird is an irregular migrant; with some individuals wintering in the south especially in colder winters and most frequently from the northernmost parts of the breeding range. (Brush 1999, Lockwood and Freeman 2004). 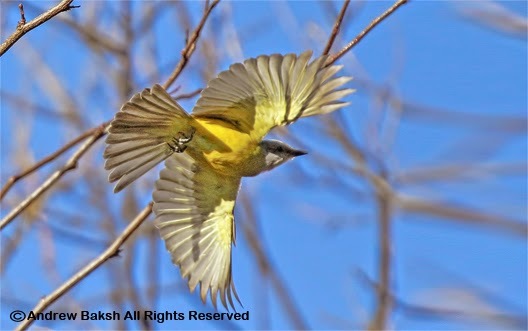 Lockwood and Freeman 2004 further characterize the Couch’s Kingbird as a common to uncommon summer resident in the lower Rio Grande valley and locally uncommon further north in the South Texas Brush Country. So by now the picture becomes a bit clearer on all the hubbub over these two Kings of New York. 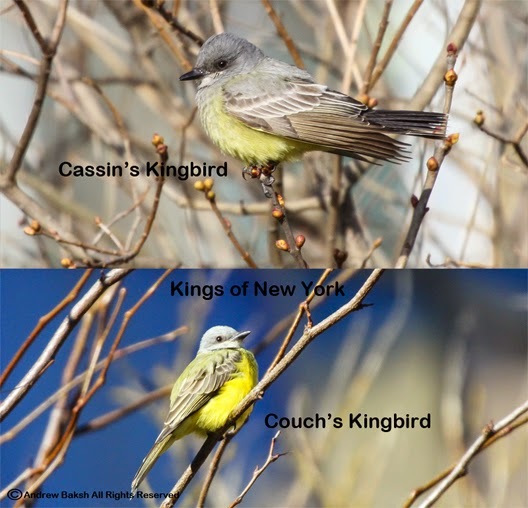 The Couch's Kingbird, is a 1st State Record (meaning the first time it has been recorded in the state) and the Cassin's Kingbird is a 2nd State Record, the first one found by my good friend Andrew Baldeli on October 13th, 2007 on Gloucester Avenue off West Lake Drive in Montauk Long Island. 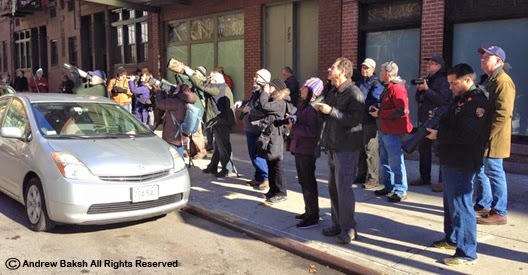 If you are a birder in New York and have not seen either of these birds as yet, I suggest you make an effort to do so. They have been around long enough for you to have by now planned a trip to NYC. If chasing/twitching is not your thing, that is fine but think of the story you would be able to tell in years to come about your quest to see the Kings of New York. Now, if that does not tempt you, I don't know what will. It was the last day of the year and I decided I would go out and pickup some bird food for my feeders as I was getting down to my last few bag of Sunflower seeds. 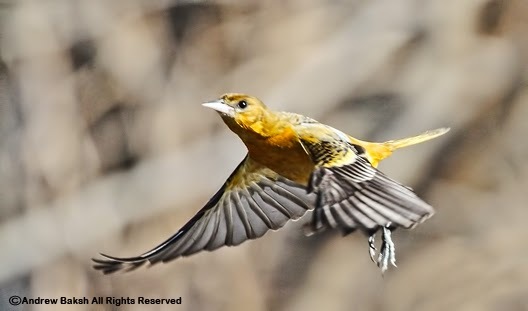 As I stepped out to check on the feeders, I caught a flash of yellow/orange as a bird flew off the feeders heading towards a row of shrubs. Obviously my presence startled it. I did not have my bins but my initial impression was an Oriole. After fetching my bins, I searched and found the subject hiding in the Pines. It was a Baltimore Oriole, I aged it as a 1st fall male and after waiting patiently, I was able to see it well once it came back to the feeders and birdbath. I was excited to see this bird on the last day of the year and wondered if it would stick around for January 1st. As it happened it did; I picked it up after returning from birding in Manhattan (more on that in another post), making a stop at home before heading to Brooklyn. 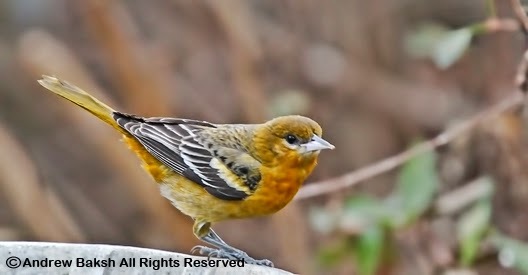 For my yard records, December 31st was the latest sighting of a Baltimore Oriole and January 1st is the earliest. Fitting for my first post of 2015.